The 70-238 Real Practice-Lab will provide you the necessary platform to gain hands on skills in Exchange Server 2007. By completing the lab tasks you will improve your practical skills in upgrades and migrations, backup solutions, server role deployment, messaging compliance, monitoring and reporting. Becoming proficient in these tasks will also help you understand the objectives and competencies required by the PRO: Deploying Messaging Solutions with Microsoft Exchange Server 2007 certification exam. Upgrades and Migrations: Using your Real Live Practice-Lab you have the ability to deploy and upgrade to Exchange Server 2007. No need for your own equipment or licenses as this is all available and ready for you to use. Complete all the key objectives in order to allow coexistence with Exchange 2003 Server and Exchange 2007 Sever in a single organization. Exchange Topology Deployment: Planning how to and where to place the components in Exchange 2007 is fundamental to a successful deployment. Whether it is storage group or server role deployment, understanding the pro's and cons of every scenario will assist you in delivering a environment that meets the needs of your organisation. 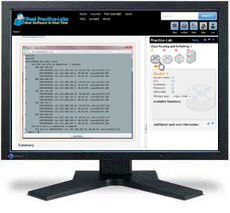 Using your Real Live Practice-Lab you can reset your servers quickly and easily which means you can change your configuration as many times as you like quickly and easily to get the desired results. Messaging Security and Compliance: Most organisations take security very seriously and this goes for their messaging platforms too. As email is used as a key business tool you need ensure the integrity of inbound and outbound messages so that they are free from virus and spam. Also you need to make sure that your messaging solutions comply with you organisations usage policy for email. In your Real Live Practice-Lab you have the ability to test and configure components such as filtering, transport rules and message compliance. Understanding these components and when to use them will ensure your organisation can confidently send and receive messages in a secure and compliant manner. Messaging Maintenance: The key to ensuring your Exchange 2007 server platform is performing as it should be is to make sure you are up-to-date with your security / application patches as well as being able to report and monitor system metrics. Because every organisations requirements and policies are different you need to understand the best way to deliver your solutions. Using your Real Live Practice-Lab you have the ability to test a number of different options, this will help you deliver the best configuration in your organisations production environment.